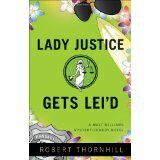 In this, the 10th book of his Lady Justice series, Robert Thornhill crafts another comedy/mystery. It will keep you on the edge of your seat in anticipation of the mystery and laughing your head off at old and new humor at the antics of his “crew” and co-workers. This time Walt enters the world of literature as he and Ox pursue a serial killer, labeled by the media as “The Librarian”. Will Walt and Company solve another one with aplomb and finesse – or by accident? We get a close look into the killer’s mind as Walt and the Kansas City police try to put together the few clues left by the suspect, Oscar Roach. Oscar smiled as he watched their faces. Robert Thornhill began his writing career at the age of sixty-six, after a successful career in real estate. He and his wife Peg, who does the covers to his books, have expanded their horizons by going into the literature business. Four of his novels in the Lady Justice series have won the Pinnacle Achievement Award from the National Association of Book Entrepreneurs as best of mystery novels. He has also written seven volumes in the Rainbow Road series (chapter books for children), a cookbook and a mini-biography. He holds a master’s degree in psychology and spent thirty years as a real estate broker. He and his wife, Peg, live in Independence, Missouri. Robert Thornhill is an excellent writer of mystery/comedy. This is shown in his first novel Lady Justice Takes a C.R.A.P., City Retiree Action Patrol. Just the title of the senior police action group gives me a chuckle. Walt Williams has retired from his occupation as a realtor, but soon finds out that he is bored and at 66, not too old to continue in some sort of job. He soon finds his niche at the police department as a volunteer with the CPP, Civil Police Patrol. So begins a new, exciting and so often funny new career for this former real estate agent. He is given all of the same tests and training that the regular officers are subject to and passes. He is assigned to ride with a regular officer named Ox. They soon show that they are a force to be reckoned with as they solve several crimes. The intervention of “Lady Justice” in the form of happenstance is the way they put away the perps – along with Walt’s senior friends, Willie, a former con man, Maggie, Walt’s sweetheart, Professor Leopold Skinner, who has a sage saying for every situation and Mary, his seventy-five year old apartment manager. Of course, there are the usual people who are against his being a police officer who give him a lot of grief, which he handles in a humorous manner. One example of how he handled the naysayers was during his initial interview when asked what he would do in a certain situation; he pulled out a taser and shot the questioner with enough volts to knock him off his chair. Although it did not endear him to the officer, it got his point across. You must read this book for the absurdity in the way the crimes are solved. Although there are some sexual references they are not gratuitous (although the author might say different), they are an integral part of the storyline. Robert Thornhill writes a lot about what he knows in that he was a realtor for thirty years. Many of the characters in his book are based on people in his real life. He has a healthy sense of humor about all segments of life. He lives in Independence, Missouri with his wife, Peg. If you don’t read Robert Thornhill’s second book, Lady Justice and the Lost Tapes, for any other reason, read it for the story of the ‘family’ Thanksgiving party. Putting the “usual suspects” together with no idea how to cook a big dinner is hilarious. They prove that it is the company that makes the day special, not the food. “Not exactly a traditional Thanksgiving, but I wouldn’t have traded it for anything in the world. Usually, the second book of a series is not as good as the first, but in this case, it is better, if that is possible. Mr. Thornhill has written what I consider another hilarious book, in case you could not figure that out from my previous comments. Two new people are added to the group, Maxine, a prostitute and friend to Willie and Jerry Singer, comedian extraordinaire (and a bit obnoxious). The cases that the little group of fearless? octogenarians solve involve Walt having to go undercover in several joke inspiring costumes, including a “john”, a gay man, a transvestite and the final one of this book, which I will not impart to you. If you have read the first book, don’t hesitate to pick this one up. Just do it when you don’t have an important appointment coming up, because you will miss that appointment. Robert Thornhill writes a lot about what he knows in that he was a realtor for thirty years. Many of the characters in his book are based on people in his real life. He has a healthy sense of humor about all segments of life. He lives with his wife, Peg in Independence, Missouri. In this, the third of the Lady Justice series, Lady Justice Gets Lei’d, Walt and Maggie are getting married, each for the first time. Pre-wedding jitters abound. Where to tie the knot? When to do it? Large or small wedding? Best man and maid of honor? All of these questions must be answered. Intervention comes in the form of Uncle Ray, a Hawaiian historian that they meet at an exhibit of Hawaiian artifacts who has a very strange prediction for Walt and Maggie. When Uncle Ray and his nephew are killed, Walt and Maggie find themselves on the way to Hawaii with their friends Mary and Willie. Plans for the wedding begin to fall into place with the help of several relatives of Ray and his nephew. But not before a mystery that involves the prediction expressed by Uncle Ray becomes a part of their trip. Travel with them as they delve into superstitions and beliefs of the native Hawaiians and they get involved with adventure on each tropical island one at a time. 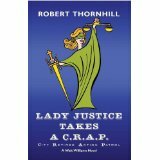 Robert Thornhill has written another hilarious and exciting story in his Lady Justice series. You will laugh all the way through it as it follows up the previous two in the series. You will laugh and hold your breath as Walt and Maggie and their friends tour the Hawaiian Islands in their own inimitable fashion. Bob and his wife, Peg, lived in Maui, Hawaii for five years, so he has continued to do what all writers are told to do – write about what you know. Lady Justice Gets Lei’d is set in the beautiful Hawaiian Islands. He now lives with his wife, Peg in Independence, Missouri. Ok, I really liked this 4th book of the Lady Justice series, Lady Justice and the Avenging Angels. When a group of religious zealots, led by an out-of-control self proclaimed “Avenging Angel”, Walt and his partner Ox are deposited in the middle of things by way of their job. The Avenging Angels have decided that Kansas City is a modern day Sodom and Gomorrah and they are chosen to rid the city of sin. We follow Walt and the ‘troops’ as they get into and out of trouble trying to keep the Avenging Angels from blowing up several city venues considered sinful by these fanatics. Do they foil the plans of the ‘bad guys’ and track down the ringleader? If so, what innovative and funny ways do they use to resolve the problem? As usual comical happenstance will come in to play. As they are solving the major crime, Willie receives a legacy from an aunt who dies. But an old piece of parchment paper that falls out of Willie’s old family Bible is what starts them on a quest for more answers to his family history. What he discovers and what he does with this legacy is the theme of this sub-story. 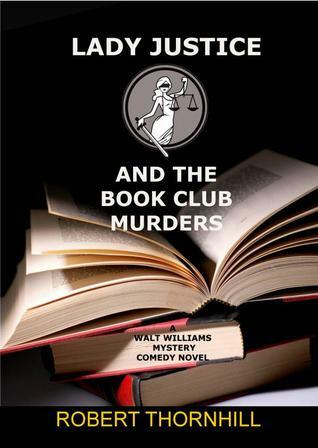 Follow this unlikely group of seniors as they unravel the mystery woven by this hilariously funny, master crime writer. I did have one technical problem with the book. When Walt goes to the library to get information about the bad guys the librarian immediately hands over personal information. That would not happen in real life, as librarians are very protective of their library patrons. I am sure creative license came into play, but it might have been more interesting to make Walt have to go through the proper procedure and obtain a warrant for information dealing with patron confidentiality. As in his other Lady Justice novels, Robert Thornhill writes from what he knows. He lives with his wife, Peg, in Independence, Missouri. 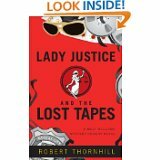 Again, Robert Thornhill has penned another funny novel in Lady Justice and the Sting. He has combined the powerful pharmaceutical business and corrupt politics to stage another riotous mystery that will tickle your funny bone and satisfy your mystery itch. Walt and Ox are called on to help solve the mystery of the deaths of a doctor and his assistant with no apparent motive. This leads to the aforementioned corruption and questions of government involvement in the process of certifying pharmaceutical drugs. Although the novel is fiction, Mr. Thornhill has based his storyline on Kevin Trudeau’s book, Natural Cures “They” Don’t Want You To Know About and Dr. David G. Williams newsletter, Alternatives For the Health-Conscious Individual. The premise is that everyone has the choice to live a healthy lifestyle. Walt is targeted by an assassin because he thwarted attempts on the life of another doctor who holds information that could cause the loss of billions of dollars for a pharmaceutical company. He plots a sting to put a stop to the corruption in the vein of “The Sting” starring Robert Redford and Paul Newman and save himself and Maggie from being killed. Tag along with Walt and his friends as he solves yet another crime with coincidental humor and senior perception. Robert Thornhill has written six Lady Justice novels, seven volumes in the Rainbow Road series (chapter books for children), a cookbook and a mini-biography. He holds a master’s degree in psychology and spent thirty years as a real estate broker. He and his wife, Peg, live in Independence, Missouri. Lady Justice and Dr. Death is the 6th in the Lady Justice series written by Robert Thornhill. It is a novel of tragic activities that mimic the actions of Dr. Kevorkian and comedic actions that mimic Walt’s unique behavior. Walt goes undercover again – this time as a terminally ill patient. His cover is blown, but we don’t find out for sure why until the end. That is the first teaser to get you interested in what happens and read it for yourself. At one point Walt is thrown off a building and falls onto a taco cart that saves his life. This leads to a near death and an out-of-body experience that will make you laugh out loud or cry crocodile tears (or both), so don’t read that part in public. Another teaser. There is a short foray into the FDA story from the last book. Didn’t read it? Well, you will have to go back and read it to catch up. It actually ties up some loose ends. Teaser number 3. “The captain smiled. “I think we can spare you and Ox for awhile for a good cause. This is another book by Robert Thornhill that you can’t miss. Notwithstanding all the fiction, Mr. Thornhill asks questions that we have all asked ourselves at one time or another. He does not actually answer the questions, but he does hint at how Walt would answer them. His premise leaves it open to you and your ideas and beliefs. Robert Thornhill writes a lot about what he knows. Many of the characters in his books are based on people in his real life. He has a healthy sense of humor about all segments of life. He lives in Independence, Missouri with his wife, Peg. Lady Justice and the Vigilante is another comedy/ mystery thriller written by award winning Robert Thornhill for our reading enjoyment. This time he takes a story from the “headlines” (really, the movies in this novel) and adapts it to his unique style. Walt Williams and the rest of the crew take on a vigilante who is stalking Kansas City and using his own brand of justice to rid the town of those he considers lawbreakers. The vigilante takes his cue from the Charles Bronson movies about a vigilante who believes he is cleaning up the streets of his town. Mr. Thornhill’s vigilante does the same. The people of Kansas City are divided as to the morality of the issue. And again, he leaves the right or wrong of it up to you, the reader. Walt and his band of crime-fighting crew work together with their usual hilarious unorthodox ways of solving crimes, but this time, they work closer with the ‘perp’ than usual. The vigilante joins the City Retiree Action Patrol, becoming a trusted member of the team. Join Walt and his band as they seek to solve this case and bring the vigilante to justice. The end will surprise you. Robert Thornhill began writing at the age of 66. He has written seven novels in the Lady Justice series, seven Rainbow Road series for children, a cookbook and a mini-biography. He lives with his wife, Peg in Independence, MO. His website is www.BooksByBob.com. Robert Thornhill has written another winner in Lady Justice and the Candidate. His inimitable style of writing comedy within a mystery will capture his reader’s imagination yet again. You will laugh in many places and have chills in others. Walt Williams, a senior police officer with the Kansas City Police Department, is asked to help protect an independent Presidential candidate because of a very interesting fact. He was the spitting image of the candidate. “”We have enough creditable intel to know that the man’s life is in danger and it’s our job to protect him. We join Walt and Ben Foster, the candidate, on the campaign trail with some trepidation. Walt has been sworn to absolute secrecy, so not one of his usual cohorts, with the exception of his wife, Maggie, knows what he is doing. There is an attempted assignation or two that he has to circumvent, answer questions about the candidates’ stand on issues without knowing all of the background and generally stand in for him several times. How will Walt get out of this escapade that he gets involved in? Will he have the help of the Secret Service? The Kansas City PD? The local citizens? His rag tag bunch of cohorts? Or will he have to rely on himself? You must read Mr. Thornhill’s book to find out the answer. Robert Thornhill began writing at the age of 66. He has written nine novels in the Lady Justice series, seven Rainbow Road series for children, a cookbook and a mini-biography. He lives with his wife, Peg in Independence, MO. His website is www.BooksByBob.com.